Jason T. Lamoreaux of Somewherecold faces the 5in5 challenge with his project The Corrupting Sea. Five minutes of cinematic sci-fi soundscapes, who needs the movie when you can just get the soundtrack? As part of the five in five series though Silber Media, demanding of musicians to encompass five different ideas within a five minute time frame you would be correct to assume the challenge is an ongoing endeavour. The Corrupting Sea picked up the gauntlet and in Looking To The Stars has been able to encapsulate from a rocket launch to encircling a distant galaxy with in the parameters. 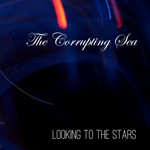 The Corrupting Sea's EP, Looking To the Stars, is another entry in the label's 5 in 5 series, where artists do 5, one minute songs on the EP. This EP is an ambient post-rock look at ingenious synthesizer pads and patterns. Not all together sure whether this is part of Silber’s ongoing 5 in 5 series, I suspect it is, because what lurks here upon the digital grooves of ‘looking to the stars’ are five tracks totalling 5 minutes of music. A radical departure from the usual Corrupting Sea script, that is if you don’t count the parting ‘inhabitable planet’, a brooding beauty equipped with all the trademark stilled grace and somewhat sounding ice sculptured and solitary, like a passing celestial herald emitting opining love notes. ‘looking to the stars’ serves as a, if you would, sonic story board, it relates to its authors love of sci-fi, each of the titles directing you like scenes / chapters into voyages of discovery. In truth it reads like one of those classic 50’s style space age radio broadcasts, the sounds crystal tipped in a vintage futuristic sound a la ‘journey into space’ et al, which like such a broadcast and / or book captures the atmosphere succinctly, colouring the non visual canvas through detailed narrative and / or sonic chemistry. Case in point, ‘entering the stratosphere’ operates on two possibly three levels, in so much you can feel the weight of the g-force as the rocket escapes the clutches of mother Earth, but then there’s the string section ushering in a sense of wonderment and mystery as the capsule hurtles into the unknown and simultaneously takes note of the crews own sense of peril. The eerie and airless ‘plotting a course’ frames perfectly that sense of arriving at a point of no return and coming to terms with new challenges while ‘keeping time with hibernation’ is pure 60’s styled Radiophonic Workshop leaving ‘new planet horizon’ – as were steeped in expectation and part fear, to inhabit a subtle Eno like phrasing.